What's your favourite hair/eye color combo? I don't know, I like them all. I wish I was joking but seriously, I have no preference. Till now most guys I've ever been attracted to had dark hair and dark eyes though. But that may be a coincidence. What Do You Think Of Billie Eilish's Style? Are Designer Clothes Worth It? Is there a tattoo you regret getting? Guys, what style of dress do you prefer for your ideal woman? And Girls, which do you prefer to wear? Do you think Priyanka Chopra is attractive? It can be any eye color really but probably something like this. Red hair, green eyes. Any and everyday of the week. Brown/black hair, with green eyes is my favorite, but seen a lot of guys with brown eyes which I liked. Personally, I never figured hair and eyes into the attraction aspect. I'm attracted to women of different types for different reasons. I don't really have one to be honest, but if I had to choose light brown hair with grey or blue eyes. 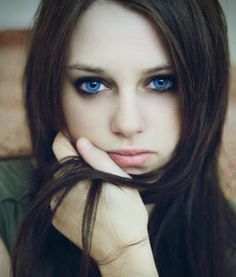 Grey and blues eyes are so pretty. Dark brown hair with glistening green eyes... I'd melt like butter! dark hair with any eyes. Rich, warm brown eyes and dark or red hair. Home > Fashion & Beauty > What's your favourite hair/eye color combo?